Italian motor manufacturer Alfa Romeo has participated many times in Formula One. It currently participates as Alfa Romeo Racing while being operated by Sauber Motorsport AG. The brand has competed in motor racing as both a constructor and engine supplier sporadically between 1950 and 1987, and later as a commercial partner since 2015. The company's works drivers won the first two World Drivers' Championships in the pre-war Alfetta: Nino Farina in 1950; and Juan Manuel Fangio in 1951. Following these successes Alfa Romeo withdrew from Formula One. During the 1960s, although the company had no official presence in the top tier of motorsport a number of Formula One teams used independently developed Alfa Romeo engines to power their cars. In the early 1970s, Alfa provided Formula One support for their works driver Andrea de Adamich, supplying adapted versions of their 3-litre V8 engine from the Alfa Romeo Tipo 33/3 sports car to power Adamich's McLaren (1970) and March (1971) entries. None of these engine combinations scored championship points. In the mid-1970s, Alfa engineer Carlo Chiti designed a flat-12 engine to replace the T33 V8, which achieved some success in taking the 1975 World Sportscar Championship. Bernie Ecclestone, then owner of the Brabham Formula One team, persuaded Alfa Romeo to supply this engine free for the 1976 Formula One season. Although the Brabham-Alfa Romeo's first season was relatively modest, during the 1977 and 1978 World Championships their cars took 14 podium finishes, including two race victories for Niki Lauda. The company's sporting department, Autodelta, returned as the works team in 1979. This second period as a constructor was less successful than the first. Between the company's return and its withdrawal as a constructor at the end of 1985, Alfa works drivers did not win a race and the team never finished higher than sixth in the World Constructors' Championship. The team's engines were also supplied to Osella from 1983 to 1987, but they scored only two World Championship points during this period. The Alfa Romeo logo returned to Formula One in 2015, appearing on the Scuderia Ferrari cars. In late 2017, Alfa Romeo announced that they were to become title sponsors for Sauber from 2018, and had entered into a technical and commercial partnership with the team. Alfa Romeo returned to the sport as their own team when Sauber was renamed at the beginning of 2019. The Alfa Romeo 159 Formula 1 car. Alfa Romeo had often been a force in Grand Prix racing before World War II. Cars like the P2 and the P3 were winners on a regular basis until the German Mercedes and Auto Union cars came around in 1934; Alfa by this time had withdrawn temporarily as a manufacturer from racing, but continued to give direct support to privateers like Enzo Ferrari and his Scuderia Ferrari team. From 1934 to the start of World War II in 1939, Alfa rarely won and their cars looked rather outdated and badly built compared to the high-tech Silver Arrows of Mercedes.[who?] Alfa was able to make the 158 for the 1938 season, although this car was not really competitive against the Silver Arrows[clarification needed]; but was to become totally dominant later on; Alfa continued to use this car at Grands Prix in 1946 to 1949. When the new Formula One World Championship had come around, Alfa had absolutely dominated post-WWII racing from 1946 to 1949 – winning every Grand Prix they entered with the exception of 3. In 1950 Nino Farina won the inaugural World Championship of Drivers in a 158 with supercharger, in 1951 Juan Manuel Fangio won while driving an Alfetta 159 (an evolution of the 158 with a two-stage compressor). The Alfetta's engines were extremely powerful for their capacity: in 1951 the 159 engine was producing around 420 bhp (310 kW) but this was at the price of a fuel consumption of 125 to 175 litres per 100 km (1.5 mpg–U.S. / 3 mpg–imp). In 1952, facing increased competition from their former employee, Ferrari; Alfa Romeo, a state-owned company, decided to withdraw after a refusal of the Italian government to fund the expensive design of a new car to replace their 13-year-old workhorse. 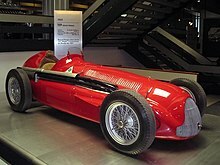 Surprisingly, Alfa Romeo involvement in racing was made with a very thin budget, using mostly pre-war technology and material during the two seasons. For instance the team won two championships using only nine pre-war built engine blocks. The Alfa Romeo 177 which was used during the 1979 season. The Alfa Romeo 179B which was used during 1981. The Benetton sponsored Alfa Romeo 185T in 1985. During 1977, and after some persuasion by Chiti, Alfa Romeo gave Autodelta permission to start developing a Formula One car on their behalf. Thus named the Alfa Romeo 177, the car made its debut at the 1979 Belgian Grand Prix. The partnership with Brabham had finished before the end of the season, with Bernie Ecclestone's outfit returning to Ford/Cosworth DFV engines. This second Alfa works Formula One project was never truly successful during its existence from the middle of 1979 until the end of 1985. During this period Alfa Romeo achieved two pole positions, Bruno Giacomelli led much of the 1980 United States Grand Prix before retiring with electrical trouble, three 3rd places, two 2nd places and one fastest lap. They also endured tragedy when their driver Patrick Depailler was killed testing for the 1980 German Grand Prix at the Hockenheimring. In 1981 they had the services of Mario Andretti, but continued to be dogged by poor reliability. After a restructuring of Autodelta, the team operations and design of the car were outsourced to Euroracing in 1982, with the works engines still being supplied by Autodelta. The team's best season was 1983 when the team switched to the turbocharged 890T V8 engine and achieved 6th place in the Constructors' Championship, largely thanks to two second-place finishes for Andrea de Cesaris. While the turbocharged 890T proved competitive in 1983, more powerful and fuel efficient engines from BMW, Ferrari, Renault, TAG-Porsche and Honda, plus the FIA imposed 220-litre fuel limit with no re-fuelling allowed during pit stops during 1984, saw the decline of the Euroracing Alfa Romeo team as a competitive force in Grand Prix racing. The 890T (the only turbo V8 engine used in GP racing at this time) was very thirsty and suffered badly at fast circuits- particularly both of Alfa's home circuits of Imola and Monza. To temporarily rectify this problem, the team had to run with less boost in order to save fuel- which made the engine underpowered, and this proved to be a severe hindrance at fast circuits- the kind of circuits where they almost always had to do that. The engine was developed but the fuel consumption problems were never really rectified. Riccardo Patrese's third-place finish at the 1984 Italian Grand Prix being the last podium finish for the team, with both Patrese and Eddie Cheever often failing to finish races throughout 1984 and 1985 due to running out of fuel- Cheever ran out of fuel 5 laps before the end at Alfa's home Grand Prix at Monza- close to Alfa's headquarters in Milan. The team's 1985 car, the Alfa Romeo 185T proved to be so uncompetitive that the 1984 car, the 184T was re-called into service mid-season. After being updated to 1985 specifications the car, now dubbed the 184 TB, was actually an improvement over the 1985 car, but results were still not forthcoming. In an interview he gave in 2000, Riccardo Patrese described the 185T as "the worst car I ever drove". Alfa Romeo pulled out of Formula One as a constructor following the final race of the 1985 season in Australia. In January 2019, Sauber announced the team will rename to Alfa Romeo Racing, but unlike BMW Sauber, the ownership, racing licence and management structure will remain unchanged. During the 1960s, several minor F1 teams used Alfa Romeo straight-4 engines in cars such as the LDS Mk1 and Mk2 "Specials", Coopers and De Tomasos. 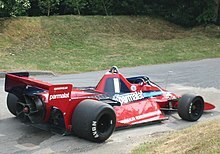 The radical 1978 Brabham BT46B, which was known as the "Fan Car" due to its large fan was powered by an Alfa Romeo engine. Peter de Klerk's Alfa Romeo Special. In 1962, Peter de Klerk created a custom-made, single seater racing special built for the South African Formula One Championship. De Klerk's car was powered by an Alfa Romeo Giulietta 1.5-litre straight-4 engines that was also used by LDS, but unlike the LDS cars, de Klerk's own car was christened as the Alfa Romeo "Special". The Special participated in two Grands Prix, retiring at the 1963 South African Grand Prix and finishing 10th at the 1965 South African Grand Prix. It also entered five non-championship Grands Prix, scoring a podium finish at the 1963 Rand Grand Prix. In the end of 1960s Alfa Romeo was developing a new V8 engine for its racing cars, this engine was tested briefly in Cooper T86C F1-3-68 by Lucien Bianchi. Alfa Romeo briefly returned to Formula One for the 1970 and 1971 seasons with a V8 engine based on their sportscar unit. In 1970 the unit was mainly entrusted to Andrea de Adamich, a long time Alfa driver, in a third works McLaren. The combination often failed to qualify and was uncompetitive when it did run in the races. In 1971 a similar arrangement saw de Adamich run most of the second half of the season in a works March car, with a similar lack of success. For 1976 Bernie Ecclestone did a deal for the Brabham Formula One team to use Alfa Romeo engines based on their new flat-12 sports car unit, designed by Carlo Chiti. The engines were free and produced a claimed 510 bhp (380 kW) against the 465 bhp (347 kW) of the ubiquitous Cosworth DFV; although the 12-cylinder Alfa engine was heavier and used more oil and water than the 8-cylinder DFV, because of more mechanical processes going on in it. Packaging the engines was difficult – they had to be removed in order to change the spark plugs – and the high fuel consumption engine required no fewer than four separate fuel tanks to contain 47 imperial gallons (214 L; 56 US gal) of fuel. Gordon Murray's increasingly adventurous designs, like the BT46 which won two races in 1978, were partly a response to the challenge of producing a suitably light and aerodynamic chassis around the bulky unit. When aerodynamic ground effect became important in 1978, it was clear that the low, wide engines would interfere with the large venturi tunnels under the car which were needed to create the ground effect. At Murray's instigation Alfa produced a narrower V12 design in only three months for the 1979 season, but it continued to be unreliable and fuel inefficient. For the 1987 season, Alfa Romeo made a deal to supply engines to Ligier. A Gianni Tonti designed, 850 bhp (634 kW; 862 PS) twin turbo 1500 cc straight-4 named the Alfa Romeo 415T was tested in a Ligier JS29 by René Arnoux. When Fiat (the same company that owned F1 giant Ferrari) took control of Alfa Romeo, the deal was cancelled (ostensibly due to negative remarks by Arnoux about the engine, comparing it to used food) and Ligier had to use Megatron (ex BMW) engines for the entire 1987 season. Alfa also supplied engines to the small and unsuccessful Italian Osella team from 1983 to 1988. Normally aspirated (1983) and turbo (1984–1987) engines were used. In the beginning, Alfa also offered some technical input to the small Turin team; the 1984 Osella (the model FA 1/F) was based on the 1983 works Alfa Romeo 183T, the first chassis was a lightly reworked 183T. All the following Osella models up to the FA1L in 1988 had their origins in the 183T design. By 1988, the last turbo season, Alfa was fed up with the negative publicity generated by Enzo Osella's cars, so the Milan-based manufacturer prohibited the further use of its name in connection with the engine. The 1988 engines were simply dubbed "Osella V8". At the end of that season, the relationship finished, ending Alfa Romeo's involvement in Formula One. In 1985, Alfa Romeo started a V10 Formula One engine project, in anticipation of the upcoming rules forbidding turbo engines. The engine was targeted to be used with Ligier Formula One cars. This was the first modern V10 Formula One engine, followed soon by Honda and Renault engines. The Alfa Romeo V1035 F1 engine was designed by Pino D'Agostino 1986. In its first stage the 3.5 litre engine produced 583 hp (435 kW) and the last version from 1986 could produce 620 bhp (460 kW) at 13300 rpm. After the co-operation with Ligier was cancelled the engine was available to the 164 Pro Car project. In 1988, Alfa Romeo (Fiat Group) bought Motor Racing Developments Ltd. (otherwise known as the Brabham F1 team) to build a chassis for a new ProCar series. The car developed was V10 powered Alfa Romeo 164 ProCar (Brabham BT57) and was planned to race in a special racing series (as a support event to Formula One Grands Prix). Alfa Romeo branding has appeared on the Scuderia Ferrari Formula One cars since the 2015 season, starting with the Ferrari SF15-T.
Charles Leclerc driving the Alfa Romeo Sauber F1 Team's Sauber C37 during the 2018 Austrian Grand Prix. On 29 November 2017, it was announced that Alfa Romeo would be the title sponsor of the Sauber Formula One team starting from the 2018 season in a "multi-year technical and commercial partnership agreement". On 2 December 2017, a press conference was held at the Alfa Romeo Museum in Arese (Milan), illustrating the terms of the agreement between the FCA Group and the Swiss Sauber team, followed by a presentation ceremony for the livery and the driver line-up consisting of Charles Leclerc and Marcus Ericsson. On 1 February 2019, it was announced that the Sauber team would enter the 2019 season as Alfa Romeo Racing, although the ownership and management structure will remain unchanged. 1260 3.0 V12 G 35. Marlboro Team Alfa Romeo 179 1260 3.0 V12 G 22. 179D 1260 3.0 V12 M 22. 182 1260 3.0 V12 M 22. Marlboro Team Alfa Romeo 183T 890T 1.5 V8 t M 22. Benetton Team Alfa Romeo 184T 890T 1.5 V8 t G 22. 184TB 890T 1.5 V8 t G 22. Alfa Romeo Racing C38 Ferrari 064 1.6 V6 t P 7. ^ "Juan Manuel Correra signs to Alfa Romeo as F1 development driver | Formula 1®". www.formula1.com. Retrieved 22 March 2019. ^ "Grand Prix Cars – Alfa Romeo 158". ddavid.com. Archived from the original on 7 April 2007. Retrieved 26 April 2007. ^ Lini, Franco (January 1985). "La settima volta dell'Alfa" [Alfa's seventh lap]. Quattroruote (in Italian). Milan, Italy: Editoriale Domus. 30 (351): 186. ^ "Alfa Romeo 1.5 L4". f1db.com. Archived from the original on 16 July 2011. Retrieved 26 April 2007. ^ "8W - When? - South African Drivers Championship". 8W Forix. ^ "Cooper T86C Alfa Romeo". ultimatecarpage.com. Retrieved 12 June 2011. ^ "Ligier JS29". statsf1.com. Retrieved 21 November 2009. ^ "Grand Prix cars that never raced". forix.com. Archived from the original on 4 April 2007. Retrieved 26 April 2007. ^ "Alfa V10 164 Pro Car". velocetoday.com. Retrieved 25 October 2007. ^ "Brabham". mcz.com/f1. Archived from the original on 16 August 2007. Retrieved 23 August 2007. ^ "Brabham". oldracingcars.com. Retrieved 3 October 2008. ^ "Alfa Romeo – Scuderia Ferrari Sponsor". Scuderia Ferrari S.p.A. Retrieved 29 March 2018. ^ "The Sauber F1 Team enters a multi-year partnership agreement with Alfa Romeo". Sauber F1 Team. Retrieved 29 November 2017. ^ "Sauber confirm Leclerc & Ericsson, as Alfa Romeo livery revealed". Formula1.com. Retrieved 2 December 2017. ^ "Formula 1: Sauber renamed Alfa Romeo Racing from start of 2019 season". bbc.co.uk. BBC Sport. BBC News. 1 February 2019. Retrieved 2 February 2019. ^ "Alfa Romeo – Seasons". StatsF1. Retrieved 15 March 2019. Nye, Doug (1986). Autocourse history of the Grand Prix car 1966–85. Hazleton publishing. ISBN 0-905138-37-6.